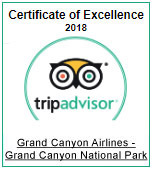 Experience the incredible sights of Antelope Canyon and Horseshoe Bend with Grand Canyon Scenic Airlines. Begin the day with a memorable flight from our Las Vegas-area terminal in Boulder City to Page, Arizona. Take to the skies and take in the views of the Desert Southwest as you approach the orange and red hues of Glen Canyon. Upon landing, you’ll transfer via shuttle to Horseshoe Bend where you can peer over the edge of the canyon to see the curve of the Colorado River below. You'll then enjoy a light meal before embarking on a guided tour of one of the most spectacular slot canyons in the world – Antelope Canyon. Get your camera ready to capture the canyon’s rippling sandstone walls and ever-changing light as the sun pierces through the stone slots. This approximate 1 hour and 30 minute journey includes aerial views of Hoover Dam, Lake Mead, Vermilion Cliffs, and Glen Canyon. Passengers will land at Page Municipal Airport and board a shuttle for transport to the ground tour. Guests are transferred to Horseshoe Bend for amazing views of the u-shaped bend in the Colorado River. A moderate hike is required to reach the overlook. Passengers will enjoy a meal before the start of the Antelope Canyon tour. Experience a guided tour into the depths of this slot canyon and find awe-inspiring sandstone walls and colorful, elegantly-shaped rock formations. Guests are taken back to the terminal for their return flight to Boulder City, Nevada. An approximate 1 hour and 30 minute flight. Upon arrival, guests check in at the transportation desk for return transfers to their hotel.